Influenza - body, last, viral, contagious, causes, What Is Influenza? Influenza (in-floo-EN-zuh), also known as the flu, is a contagious viral infection that attacks the respiratory tract, including the nose, throat, and lungs. The respiratory infection influenza, commonly known as the flu, causes symptoms that include fever, muscle aches, sore throat, and a cough. Once inhaled, flu germs quickly multiply and take over healthy cells. In its early stages, influenza sometimes is confused with the common cold because both affect similar body parts, but the flu is more severe, lasts longer, and can cause dangerous complications. 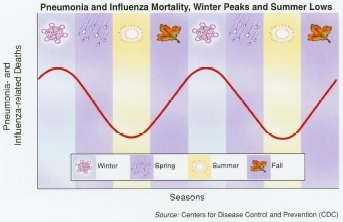 Cases of influenza virus infection typically peak in the fall and winter and decrease in the warmer months. During the 1918 pandemic, the virus killed more than 33,000 people in New York City alone, just over 1% of the city's population. they have the ability to mutate (change) so that new strains of viruses appear regularly. This is why people who are at risk for complications of flu need to get a flu vaccination every year. Millions of Americans of all ages contract the flu each year, but the people most at risk of severe illness are people over 65 years of age, children under age 5, and anyone with a serious medical condition. Flu season is November through April in the United States. Influenza is extremely contagious, mostly because people (especially school children) often spread it before they even know that they are sick. Also, those with the infection usually remain contagious for about a week after first showing symptoms. When an infected person sneezes, coughs, or talks too closely to others, the flu virus is passed through tiny drops of fluid that are launched into the air and can be breathed in by someone else. The virus can also be left on surfaces that a person with the flu has touched, such as doorknobs, desks, and keyboards, so people who forget to wash their hands after touching these things can easily become infected by rubbing their eyes or touching their mouth. How Do People Know They Have the Flu? Most people have symptoms of the flu for 7 to 14 days. The high fever and body aches usually disappear within a few days, but those symptoms may be quickly replaced by a sore throat, runny nose, and lingering cough. In some cases, fever may even return for a brief period. Feelings of tiredness and exhaustion can last several days or weeks in some people with the flu. Trying to return to a normal routine too quickly can cause symptoms, especially exhaustion, to reoccur. Sometimes people with the flu develop bronchitis * or pneumonia * . Pneumonia can be a serious complication of the flu. It usually occurs when bacteria infect lung tissue that is already inflamed by the flu virus. This complication can be life threatening in young infants and in elderly people. Influenza can also worsen the symptoms of other common heart and lung diseases, such as congestive heart failure, chronic * bronchitis, and asthma * . The flu can knock even the healthiest people off their feet for a couple of weeks. Most people recover with time and rest, but for some people with chronic medical conditions, the flu can pose a severe health risk and can even be deadly. Hundreds of thousands of Americans are hospitalized every year due to the virus, and about 20,000 die from the flu or its complications. When people complain about the stomach flu, what they actually are describing is gastroenteritis (gas-tro-en-ter-EYE-tis). The stomach cramps, nausea, and vomiting that accompany a bout of gastroenteritis usually only last a day or two and are different from the group of symptoms seen with influenza virus infection. In 1918, the world was blindsided by the most catastrophic flu outbreak of all time. In the midst of World War I, the flu virus spread to nations around the globe through soldiers traveling by boat or gathering in trenches. In less than 2 years, the flu killed over 20 million people worldwide. This pandemic (a worldwide outbreak of disease) came to be known as the Spanish Flu because Spain lost the most people to the deadly infection, nearly 8 million. How Is Influenza Diagnosed and Treated? To diagnose the flu, a doctor performs a physical examination and asks the patient questions about symptoms to find out if influenza is the culprit or if a cold or another kind of respiratory problem is to blame. A small cotton swab may be used to collect some of the fluid from the back of the nose. This fluid sample can then be tested to see if the flu virus is present. The doctor also will make sure that the person is not experiencing any complications of the flu, such as bronchitis or pneumonia. Like all viral infections, the flu will not respond to antibiotics, although in some cases they may be helpful for treating bacterial infections, such as pneumonia, that can occur as complications of the flu. The best medicine for the flu is lots of rest. Taking an over-the-counter, non-aspirin medication such as acetaminophen (uh-see-teh-MIH-noh-fen) to ease fever and muscle aches, drinking plenty of liquids, and using a humidifier to keep the air cool, moist, and easier to breathe can help people with the flu feel better as they recover. Occasionally, doctors will prescribe antiviral flu medications, such as amantadine (uh-MAN-ta-deen) or rimantadine (rih-MAN-tuh-deen). These medications do not offer a cure but can reduce the length and severity of the illness. They must be taken within 48 hours of the start of flu symptoms in order to work. Getting a flu shot can help prevent a person from contracting some strains of the flu. The vaccine contains particles from killed influenza viruses of the types expected to cause flu outbreaks during the upcoming season. After the shot, the body builds up a defense against these particular influenza virus strains. Although the flu shot does not guarantee that a person will not contract the flu, it does reduce the chance of becoming sick by 80 to 90 percent. Despite popular belief, the flu shot cannot give a person the flu. The elderly, people with certain heart and lung diseases, and workers in places such as hospitals, schools, and daycare centers should get a flu shot every year before the flu season begins in November. More recently, flu vaccination has been recommended for infants and children from age 6 months to 2 years because children in this age group are at high risk for respiratory complications of the flu. It turns out that Mom's chicken soup does more than just warm you up. The steamy soup naturally clears congestion and relieves stuffy noses and dry coughs. Researchers also have discovered that compounds found in chicken soup slow down the activity of the white blood cells that cause inflammation (and discomfort) in the respiratory tract during an infection. Because the highly contagious flu virus is easily passed from person to person through the air, the virus can be lurking almost anywhere. Experts recommend that hands be washed thoroughly with warm, soapy water for at least 15 to 30 seconds after using a public restroom and before eating or touching the face. Avoiding contact with people who have the flu can also lower the risk of catching it. By avoiding close contact in large crowds, especially at schools or in malls, and by not touching used tissues or sharing drinks, a person can reduce the chance of becoming sick. American Lung Association, 61 Broadway, 6th floor, New York, NY 10006. The American Lung Association offers guidelines on its website for the treatment and prevention of influenza. KidsHealth.org . KidsHealth is a website created by the medical experts of the Nemours Foundation and is devoted to issues of children's health. It contains articles on a variety of health topics, including influenza.